Many of these Cape winelands country hotels are situated on working wine farms and wine estates where the picturesque beauty of lush vineyards, rolling hills and majestic mountains probably originated the name of "The Fairest Cape". Here you will find a thousand reasons to sample exquisite South African wines, from a wide range of cultivars. All of them on the doorstep of your hotel. With around 20 wine routes and many interesting country towns, each day is an opportunity to discover another scenic wine route, visit wine farm restaurants and sample their glorious wines. Golfers can also enjoy a round at Cape Winelands golf courses. Seasoned travellers in pursuit of the finer things in life will find beautiful Cape Wineland accommodation and exquisite cuisine art by famous chefs, complimented with award winning South African wines. Within easy access of Cape Town, The towns of Stellenbosch, Paarl and Franschhoek still retain the peace and tranquility of a bygone era. 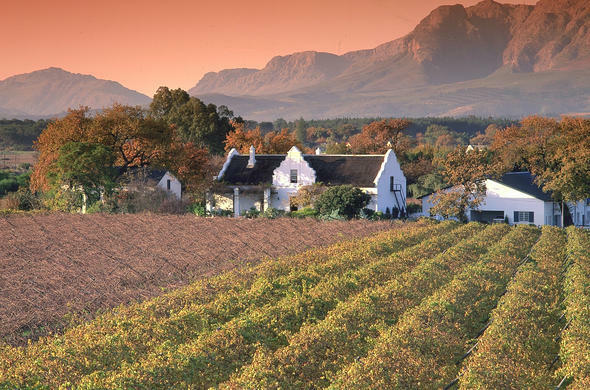 The Cape Winelands is home to magnificent buildings, monuments, museums and 400 year old cellars. For a fabulous wedding or romantic escape, Cape winelands hotels and lodges provide an ideal choice of venues. From simple to opulent, located in picture post-card scenery, combined with the arts of world renowned chefs, and attended to by people who are dedicated to sharing their love of "The Good Life" with you, you will always have the romance of the winelands in your heart.